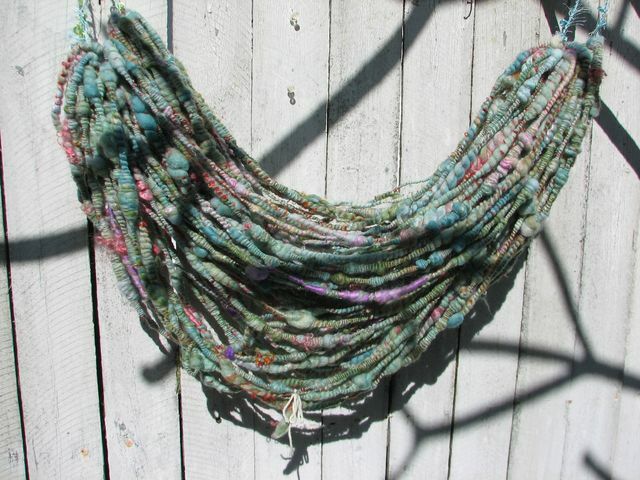 https://calamitykim.typepad.com > Wanna See My Handspun? « Back to Wanna See My Handspun? Spun from 4 batts in the Belfry Batts. First spun batt into a thick and thin yarn then plied it with beehives, coils and tornadoes! Added some silk hankies in pink and purple as I plied it onto curly bloucle mohair dyed with koolaid.